Spend money now and save on your next purchase at adidas Outlet Stores in the U.S.
You can enjoy a special offer at adidas Outlet Stores in the U.S. this weekend! 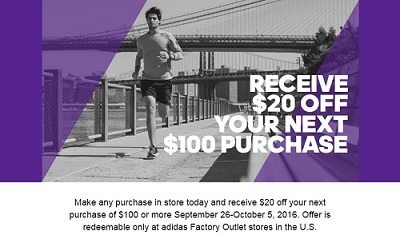 Make any purchase at adidas Outlet Stores in the U.S. today and receive $20 off your next purchase of $100 or more September 26-October 5, 2016. Offer is redeemable only at adidas Factory Outlet stores in the U.S. Source: adidas emailing. For more details visit adidas Outlet Store in the U.S.